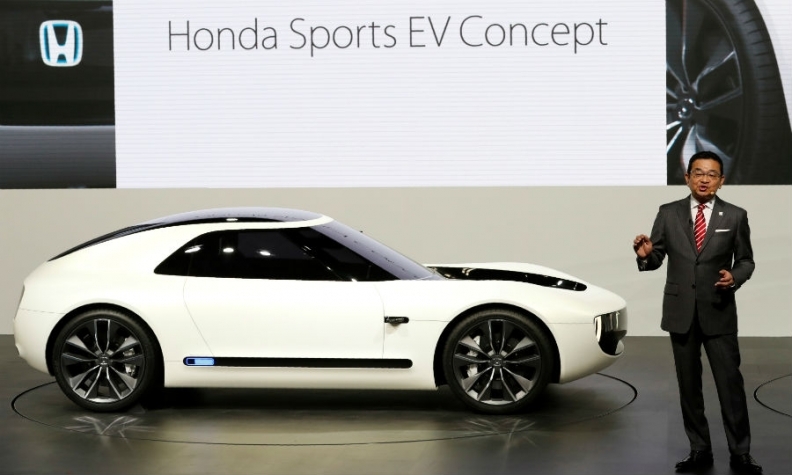 Honda CEO Takahiro Hachigo unveils the Sports EV Concept. TOKYO -- Honda unveiled a two-seat Sports EV Concept that has a low center of gravity and wide stance that the company says embodies the "beautility" of a sporty car. The car fleshes out a budding electric vehicle line from the Japanese carmaker and rides on the same platform as the Urban EV hatchback concept that debuted at last month's Frankfurt auto show. Honda said both cars represent a design philosophy of simplicity. While the Sports EV Concept gets performance proportions, much of the car – including drivetrain specifications and range – are still undecided, Honda CEO Takahiro Hachigo said after unveiling the diminutive vehicle on Wednesday at the Tokyo show. "We haven't decided any specifications, including the range, as well as when to release this car. This concept model simply represents our vision," Hachigo said. "But if we were to introduce it, I would like to bring it first to the Japanese market." While much remains up in the air with the Sports EV Concept, Hachigo said the Urban EV is much closer to market. That car will go on sale in Europe in 2019 and in Japan in 2020, he said. The Urban EV Concept is a short-range commuter for urban and rural areas. "With artificial intelligence, connectivity and driver-assist technologies, we are looking to further advance Honda Sensing and employ that in this car," Hachigo said. Honda plans to manufacture the production Urban EV in Japan. It will be one notch bigger than the cars in the Japan-only minicar segment. Hachigo said Honda decided to release it in Japan as a way to reinvigorate domestic sales and excitement for the brand. As Urban EV concept is going to be an urban commuter, Hachigo said the car may not be suitable for the U.S. market. But it does have potential in China, he said. "We see this Urban EV Concept as part of our electrification strategy," he said.